This really isn't a recipe—it doesn't even involve cooking or assembly. It's just a few simple ingredients brought together in a perfect way: radishes, butter, and salt. Most people don't give radishes a second thought mainly because they don't eat them. As I've shown in recipes before and will show this week, radishes can be made into many different dishes with ones that are even cooked. But the absolute best way to eat them is with just a little salt and butter. Radishes are a very humble vegetable, so you would never expect to eat them anywhere but home, let alone find them served at a high-end restaurant. 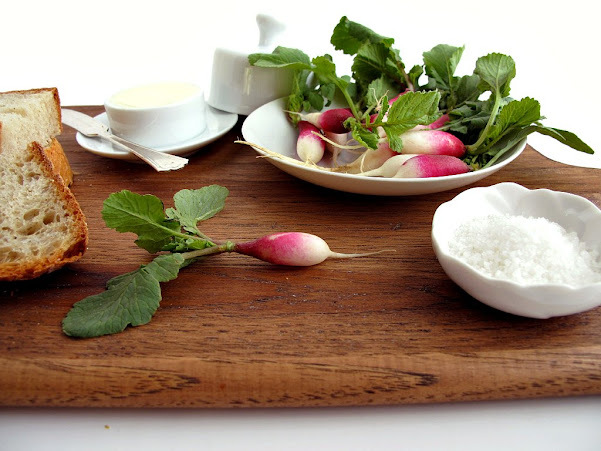 But a few years ago at ABC Kitchen I was served radishes with salt, bread, and butter. I couldn't believe my eyes because it was such a simple presentation but a very effective one that truly represented the restaurant's "green" objective very clearly—it was all about the fresh produce. Besides all the wondeful dishes I enjoyed that evening, the radishes really stood out in my mind and memory—it's why I'm writing about them now. I've always loved eating radishes with salt as a snack or side dish to sandwiches and such, but adding butter is an ingenious concept from the French. The butter really works to tame any possible sharpness from the radishes and, of course, the salt just enhances the flavor. You'll want to serve the radishes freshly washed with just a bit of water clinging to them—this helps the salt adhere when you dip them. Spread the butter on the radish or on bread and eat it together. It's a wonderful spring snack or serve it as a dinner party appetizer. So here's a nonrecipe for radishes with butter, salt, and some bread if you wish. Assemble ingredients on a tray or platter and serve.